The Targus 15.6" Laptop Privacy Screen is designed to fit 15.6" widescreen laptops with 16:9 ratio screens. To protect your information, tiny vertical blinds on the surface of the privacy screen narrow the viewing angle so data is only visible directly in front of the monitor up to 45 degrees away from the center of the screen. Onlookers will only see a dark unclear screen when attempting to view the information from a side angle. 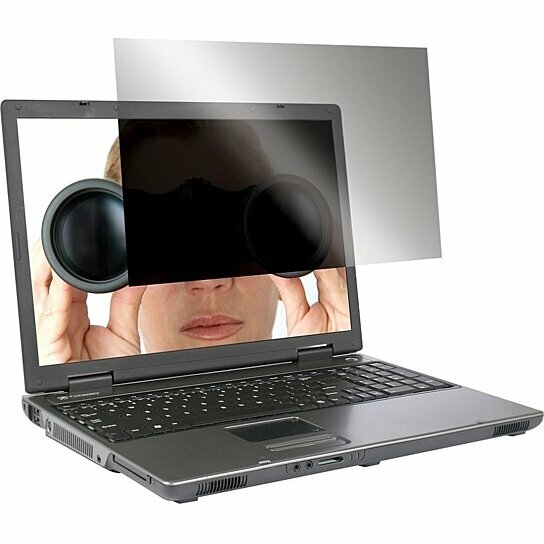 In addition to providing security, the screen also blocks the glare to help reduce eye strain. The Targus Laptop Privacy Screen can be easily attached by using clear adhesive strips designed for LCD filters or with the included tab guides that stick to the edge of the LCD bezel to hold the screen in place. Users can also position the tabs so the screen easily slides on and off. Highly portable and easy to use, the Targus Privacy Screen prevents onlookers from seeing valuable information often viewed on a laptop or LCD monitor.